Aquela is a world almost entirely covered in ocean. Thousands of islands dot the surface of the world, including Qheleq-Qarag, the one continent on Aquela which is not almost completely submerged under water. These islands, for the most part, follow the great geological features of the sea floor. There are in fact four continents on Aquela. Qheleq-Qarag is located at the north pole of the planet, and is a mountainous and frozen wasteland. 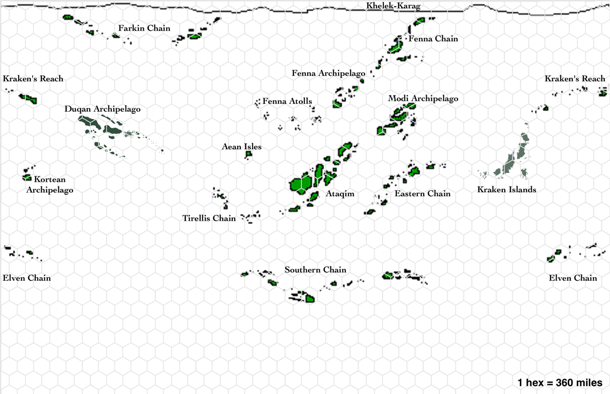 Ataqim is mostly submerged, but its highest points form a large archipelago, the center of civilization on Aquela. Duqan, too, is mostly submerged; its peaks form an archipelago of about 22 islands, larger but also more spread out than the islands of Ataqim. The fourth continent, Esselia, is completely lost beneath the waves. Legend relates that it was the homeland of the elves before a great catastrophe sank it into the ocean. In addition to the continents, four great ridges, the undersea mountain ranges, have islands at their highest points. These are the Great Kraken's Ridge, the Fenna Ridge, the Southern Ridge, and the Elven Ridge. There are several oceanic islands not connected to any of these continents or ridges, but the vast majority of islands are part of these features. Finally, two ocean canyons, the Great Rift and the Lesser Rift, and two sea basins, the Great Southern Basin and the Pit of the Kraken, are regions of tremendous ocean depth where there are no islands mapped, and where the seas become very difficult to navigate. This is particularly true of the Great Rift, which separates the islands of human civilization from the islands of the Elven Ridge and the lost continent of Esselia. Few human or dwarven boats are seaworthy enough to cross the stormy waters over the Rift, and even fewer sea captains are foolish enough to try. Aquela, naturally enough, is home to a staggering variety of fish species. The majority of these fish live in the shallower waters of continental shelves and ocean ridges, with a significant portion of the others living around uprisings where currents diverge and cold, nutrient-rich water rises to the surface. Deep-sea fish, much less common, are found in the plains, rifts, and basins of the sea. Life on land is rather different. Birds and other flying animals (bats, pegasi and the winged antelope known as elsiai, dragons, etc.) make up a large portion of air-breathing species, since they are adaptable and can spread from island to island with relative ease. Reptiles, particularly those (like marine iguanas, sea snakes, and monitor lizards) that spend much or all of their time in the water, are also common. Aquatic and semiaquatic mammals, like platypuses, sea otters, whales, dolphins, seals, walruses, polar bears, etc., are widespread, but many of the ecological niches that land mammals fill on most worlds are filled on Aquela by various amphibious species. In the amphibious species species of Aquela, evolution is played out in miniature in a single lifespan. These animals lay their eggs in coastal waters, often in beds of seaweed. The hatchlings are fully aquatic, and spend up to several years in this state—during which time they can more easily move to other islands, thus enabling the spread of the species. At the end of this period, they develop legs and lungs, until they can finally venture onto land. Only at this point do they grow into full adulthood, becoming capable of reproduction. A tremendous variety of animal species on Aquela follow this pattern of development—insects, reptiles, true amphibians (frogs, salamanders, et al. ), and even mammals (some of which lay eggs like platypuses, while others give live birth and nurse their young in shallow waters). Among the most remarkable of the amphibious reptiles are the several varieties of dragon which lay their eggs in the deep sea. Other land animals do exist. Individual islands often have unique species of such animals. Insects, in all the dizzying diversity of species in which they are found on earth, crawl, swarm, and fly on the islands of Aquela. Arachnids (spiders and scorpions) are not as common, but do exist. Some large spiders have even adapted to marine life, feeding on fish and crustaceans. Non-aquatic mammals tend to be small, due in part to the fact that competition among mammals is much less intense than on other worlds. The exception to this rule is Qheleq-Qarag, where mammals grow larger, often with multiple layers of fat.